Haidari, M., Rezaei, D. (2013). Study of plant diversity in the Northern Zagros forest (Case study: Marivan region). International Journal of Advanced Biological and Biomedical Research, 1(1), 1-10. Maziar Haidari; Dorna Rezaei. "Study of plant diversity in the Northern Zagros forest (Case study: Marivan region)". 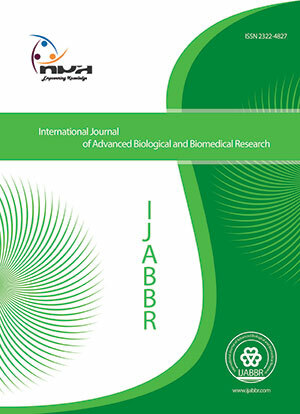 International Journal of Advanced Biological and Biomedical Research, 1, 1, 2013, 1-10. Haidari, M., Rezaei, D. (2013). 'Study of plant diversity in the Northern Zagros forest (Case study: Marivan region)', International Journal of Advanced Biological and Biomedical Research, 1(1), pp. 1-10. Haidari, M., Rezaei, D. Study of plant diversity in the Northern Zagros forest (Case study: Marivan region). International Journal of Advanced Biological and Biomedical Research, 2013; 1(1): 1-10. Silvicultural operation need to notice the species diversity. To this study Gomarlang district in marivan region, northern zagros forest was selected. In this study 30 circle sample plots (500 m2) were collected by random method. In every sample plot the kind of species and number of trees and shrub were recorded. In the sample plots the micro plots of 5 m by 5 m (i.e. area of 25 m2) were designed and Herbaceous and shrub information was recorded then. Species diversity indexes including Shannon Wiener (H׳), Simpson (1-D) and Margaleff (R1) were used to evaluate plant diversity in each sample plot. Data analyzing was done by Past and Ecological Methodological software's. Results showed that 8 tree species, 8 shrub species and 64 herb species observed in the site study. The plant species that identified in the studied region belonged to 16 trees and shrub species in 9 families. Overall results showed that the presence of 80 plant species in the study area indicates the high biodiversity in the Northern Zagros forest and herbaceous layer had the highest richness, evenness and diversity. Aubert M, Alard D, Bureau F, 2004. . Diversity of plant Assemblages in managed temperate forests: a case study in Normandy (France), Forest Ecol Manag, 175, 321-337. Baev PV, Penev LD, BIODIV. Program for calculating biological diversity parameters, similarity, niche overlap. Ardakani MR. 2004, Ecology. Tehran University Press, 340. Bazyar M, Haidari M, Shabanian N, Haidari R.H, 2013. Impact of physiographical factors on the plant species diversity in the Northern Zagros Forest (Case study, Kurdistan Province, Marivan region), Annals of Biological Research, 4 (1):317-324. Eftekhari T, Ramezani M, 2004. Introduction to Plant Biodiversity in Iran. In: Biodiversity and Medicinal Plant Wealth of South Asian Countries (Eds), National Botanical Research Institute, Lucknow-226001, India, 39-40. Fattahi M, 1994. Study on Zagros oak forests and the most important their destruction causes, Institute of Forests and Rangelands Research press, Sanandaj, Iran. Ghazanfari H, Namiranian M, Sobhani H, MarviMohajer M.R, 2004. Traditional forest management and its application to encourage public participation for sustainable forest management in the northern Zagros mountain of Kurdistan province, Iran, Scandinavian Journal of forest science, 19, 65-71. Jazirehi MH, Rostaghi EM, 2003. Silviculture in Zagros. University of Tehran Press, Tehran, 520p. Magurran A.E, 1988.Ecological diversity and measurement. Princeton University Press, Princeton, 354p. Mirdavoodi HR, Zahedi Pour H, 2006. Determination of suitable species diversity model for Meghan playa plant association and effect of some ecological factors on diversity change. Pajuhesh & Sazandegi j, 68, 56-65. Peet R.K, 1974. The measurement of species diversity. Ann. Rev. Ecol, Systematics 5,285-307. Pourbabaei H; Navgran S, 2011. Study on floristic and plant species diversity in the Lebanon oak (Quercus libani) site, Chenareh, Marivan, Kordestan Province, western Iran Biocenose Journal, 3 (1), 15-22. Schuler A, 1998. Sustainability and biodiversity – forest historical notes on two main concerns of environmental utilization, Assessment of Biodiversity for Improved Forest Planning, Kluwer Academic Publishers, Dordrecht, 353-360.